Intensive Care Unit (ICU) delirium is a nonspecific, potentially preventable, and often reversible disorder of impaired cognition, which results from various causes in ICU patients. The term is derived from the Latin word “delirare” which literally means “to go out of the furrow” or figuratively “crazy or deranged.” It is often poorly recognized by treating physicians, leading to inappropriate management. It occurs more frequently among hospitalized elderly patients (up to 30%). Earlier studies have suggested a higher rate of delirium in mechanically ventilated patients ,, as compared with nonmechanically ventilated patients (20%–50%). The cost associated with delirium in mechanically ventilated patients in the US alone is around 4–16 billion dollars per year. Delirium in ICU patients is associated with increased duration of mechanical ventilation (MV), prolonged hospitalization, increased rates of self-extubation, and increased risk of mortality., Several investigators have identified that prolonged duration of delirium, following critical illness in ICU, is independently associated with increased risk of mortality. It has been suggested that ICU delirium may contribute to long-term cognitive dysfunction. It is estimated that around one-third of high-risk elderly patients can be prevented from developing delirium. Therefore, early diagnosis, appropriate management, and disposition of delirious elderly patients may improve the patient outcome. This review focuses on the epidemiology, assessment tools, pathophysiology, risk factors, and management of delirium in ICU patients. A traditional narrative literature search was conducted using the PubMed and EMBASE search engines. The search was limited to the duration from January 1995 to December 2015. We used the search terms such as “delirium,” “intensive care unit,” “acute confusional state,” “brain dysfunction,” “pathogenesis,” “evaluation,” “treatment,” and “prevention” in different combinations to enhance the retrieval of articles. In addition, Google Scholar searches were performed. Reference lists of relevant studies were also hand searched to include further studies. Only original articles in the English language were included. The prominent features of delirium include inattention, disturbance of consciousness within short periods, and sudden change in psychotic features from baseline. Moreover, other cognitive changes such as memory loss, confusion, language disturbance, or emotional disturbance may not be easily detected in ICU patients with severely reduced level of consciousness. Delirium represents the most frequent manifestation of acute brain dysfunction in ICU. ICU delirium may be classified as hyperactive (agitated), hypoactive, or mixed type. Hypoactive delirium is more frequent among critically ill patients admitted to ICU. It appears to result in greater need for MV, prolonged ICU length of stay, and increased risk of mortality in comparison to hyperactive delirium.,, Hypoactive and mixed types are the two frequently observed types in ICU patients. To minimize the incidence, severity, and duration of delirium, early diagnosis and management of ICU patients for delirium are crucial. It is estimated that delirium remains undiagnosed in three-fourths of patients in the absence of structured detection tools. There are number of validated detection or screening tools for delirium which have been developed for different patient populations admitted to hospital wards, ICUs, and emergency departments. Before screening for delirium, a thorough assessment of consciousness level of patients should be undertaken using an established Sedation–Agitation Scale (SAS) such as Richmond Agitation–Sedation Scale (RASS). It allows categorization of patients based on the level of consciousness. RASS-3 is the preferred level of consciousness for screening patients for delirium, in which patients should be rousable to voice. After assessment of the consciousness level, screening should be initiated. Particularly, ICU patients need more focus as they are often intubated, sedated, physically weak, and therefore more susceptible to under diagnosis of delirium. The CAM-ICU  and ICDSC  are the two best-studied and most widely accepted scales in clinical practice. CAM-ICU is the modified version of CAM. In patients who are sufficiently alert, the CAM-ICU tool assesses two important components of clear thinking, namely, judgment and attentiveness. A deficit in either of these domains suggests the presence of delirium. The CAM-ICU has higher sensitivity (64% vs. 43%) but lower specificity (88% vs. 95%) for the presence of delirium than the ICDSC in a mixed ICU population., Moreover, CAM-ICU has high criterion validity and reliability for delirium assessment in critically ill patients when compared with Nu-DESC and DDS. Delirium is defined in terms of four diagnostic features and is deemed positive when feature 1 (acute onset or fluctuating course) and feature 2 (inattention) and either feature 3 (altered level of consciousness) or feature 4 (disorganized thinking) are present (www.icudelirium.org). van Eijk et al. observed better diagnostic accuracy of CAM-ICU than that of ICDSC. In contrast, Plaschke et al. demonstrated high agreement results from both scales. An earlier study reported a higher sensitivity, specificity, and reliability of CAM-ICU after translating it to the Chinese language. The pathophysiology of delirium in critically ill patients remains poorly understood. It is hypothesized that cholinergic deficiency might contribute to the occurrence of delirium. This is supported by recent reports suggesting an association between the use of anticholinergic medication in the ICU and development of delirium. In addition, patients with delirium show higher serum cholinergic activity as compared to patients without delirium. Another hypothesis is that excessive release of dopamine along with a decrease in acetylcholine may cause delirium. Moreover, both increased and decreased serotonergic activity have been associated with delirium, suggesting that varying levels of amino acids (precursors of cerebral neurotransmitters) may play a role. Gamma-aminobutyric acid (GABA) is an inhibitory neurotransmitter that has been implicated in the cause of delirium. For chronic alcoholics, one of the risk factors for delirium is the reduction in functionality and number of GABA receptors and enhancement of N-methyl-D-aspartate receptors. Furthermore, several environmental and medical factors trigger the host immune system to release cytokines which mediate inflammatory and immune responses to stress. Such events may enhance the risk of delirium through various mechanisms, such as direct neurotoxic effects and enhanced permeability of the blood–brain barrier. Neuroimaging is currently mainly conducted in research settings to diagnose delirium. It includes novel modalities such as functional magnetic resonance imaging, diffusion tensor imaging, arterial spin labeling, and positron emission tomography. Most of the investigations revealed nonspecific or diffuse changes in time, such as cortical atrophy, ventricular enlargement, and white matter hyperdensities. A systematic review of six observational studies identified 25 risk factors for delirium in the ICU. Of these, 21 factors (including nine laboratory parameters and seven related to medication) are considered precipitating factors (related to the underlying disease), whereas the remaining four (older age, respiratory disorder, alcohol abuse, and dementia) are considered predisposing factors for delirium. Hipp and Ely , broadly classified these risk factors into three categories: (a) features of the acute illness, (b) patient or host factors, and (c) environmental or iatrogenic factors. Patient characteristics that are related to a higher risk of developing delirium include living alone (odds ratio: [OR] 1.94), use of alcohol >3 units/day (OR: 3.23), and smoking >10 cigarettes/day (OR: 2.04). van Munster et al. investigated the role of genetic predisposition to delirium among elderly patients. The authors suggested that the apolipoprotein E4 (APOE4) genotype was not only a significant predictor of delirium in ICU patients, but its presence was also independently associated with a prolonged duration of delirium. Apart from acute illness (severe sepsis or congestive heart failure), delirium can be precipitated by the iatrogenic administration of certain medications. These potentially modifiable factors include antihistamines, anticholinergics, antibiotics, corticosteroids, opiates, benzodiazepines, and metoclopramide. Some investigators have reported the use of lorazepam and midazolam to be independent risk factors for the development of ICU delirium., Appropriate management of acute illness and avoidance of iatrogenic factors are thus sensible targets for the prevention of delirium. Preventative strategies include nonpharmacological and pharmacological approaches. A combination of both practices is often used in clinical practice. These are intended to prevent or reverse modifiable factors related to the occurrence of delirium. As delirium is a multifactorial syndrome, prevention should ideally focus on a multicomponent protocol. Nonpharmacological interventions targeted at specific aspects of care among high-risk elderly patients have been shown to be successful., The Hospital Elder Life Program in the United States trained interdisciplinary teams to recognize six delirium factors (systematic orientation, therapeutic activities designed to lessen cognitive impairment, early mobilization, eyeglass/hearing optimization, correction of dehydration, and prevention of sleep deprivation). The authors demonstrated that nonpharmacological intervention may decrease the odds of developing delirium among elderly patients by up to 40%. Although the study was conducted in non-ICU patients, the components of this intervention may be applicable to critically ill patients in ICU. A recent study by Van Rompaey  investigated the effect of noise on the quality of sleep and the occurrence of delirium. The authors demonstrated that the use of earplugs at bedtime lead to better sleep and delirium prevention, especially if used within 48 h of admission. In several institutions, attempts are being made to minimize the level of noise by discontinuing the use of unnecessary monitors or equipment, not to use telephone near the patient, adjusting alarm volumes to the safest minimum level, and the use of ear plugs. The overall hospital stay, frequency of room changes, family support, absence of clock and reading glasses, and existence of medical or physical restraints are potentially preventable hospital risk factors significantly associated with higher delirium severity., Moreover, the National Institute for Health and Care Excellence developed guidelines to improve sleep. They recommend avoiding any intervention during sleeping hours, scheduling medication rounds to avoid sleep disruption, and controlling noise to a minimum during sleep time. Critically ill patients requiring MV often receive sedation and analgesia to relieve pain and anxiety and thus reduce physical stress and oxygen consumption. An evidence-based approach should be used for weaning from MV. One such approach is referred to as the Awakening and Breathing Coordination of daily sedation and ventilator removal trials, Choice of sedative or analgesic exposure, Delirium monitoring and management, and Early mobility and Exercise (ABCDE) bundle. “Liberation” from MV and ICU refers to the reduction of harmful effects of sedative exposure through the use of target-based sedation protocols, spontaneous awakening trial (SAT) strategies, and proper choice of sedatives. “Animation” refers to early mobilization of patients which can minimize delirium and poor long-term cognitive outcomes. Vasilevskis et al. recommend that the ABCDE bundle should be adopted for patients on a daily basis (unless stopped by the treating physician) and is considered a practical measure for assessing the quality of care in ICU. Adopting evidence-based organizational approaches such as the ABCDE bundle could improve outcomes in ICU patients. It has been reported that a “wake up and breathe” protocol that combines daily SAT (i.e., interruption of sedation) with daily spontaneous breathing trials (SBTs) results in better outcomes as compared to current standard approaches. In the intervention group, the patients were extubated 3 days sooner and had 4 days reduction of ICU and hospital length of stay and 14% absolute reduction in mortality at 1 year as compared with the standard care arm. RASS and SAS are the most commonly used and validated sedation assessment tools for measuring quality and depth of sedation in adult ICU patients., RASS scale has been shown to be quick and easy to use by medical staff and is also the only tool tested to detect variation in conscious level over time. Strict implementation of sedation scales in the ICU may decrease the need for sedation and consequently decrease the incidence of delirium. The pain, agitation, and delirium (PAD) guidelines for ICU patients were revised by The American College of Critical Care Medicine in 2013. These are comprehensive recommendations which include the management of PAD among critical patients, using an integrated and interdisciplinary approach. The guidelines emphasize the evaluation and treatment of pain, before administering sedatives (minimum level), so that ICU patients interact with their environment without agitation. The PAD care bundle also integrates evidence-based practices such as spontaneous awakening trials (SATs), SBTs, and early mobility and sleep hygiene programs. The PAD guidelines also recommend prevention and treatment of delirium in ICU patients using both nonpharmacologic as well as pharmacological strategies. The key recommendation from the PAD guidelines is an “analgesia- first strategy” and reducing the need for sedatives in ICU. If using antipsychotics, strict electrocardiogram monitoring is mandatory as antipsychotics are known to cause QT prolongation and torsade de pointes. In line with this, a number of other societies have consolidated their guidance on delirium management in ICU. Delirium is distressing for patients, families, and caregivers. The administration of antipsychotics is recommended by the guidelines, and it is a part of routine clinical practice., However, the efficacy or safety of antipsychotic medication for treating delirium has not been extensively investigated by evidence-based randomized controlled clinical trials in critically ill patients. The most frequently used antipsychotic medications for treating delirium include haloperidol (75%–80%) and atypical antipsychotics (35%–40%)., These antipsychotic medications are endorsed by the Society of Critical Care Medicine and remain the first-line treatment. Haloperidol is a butyrophenone antipsychotic which is considered a cortical dopamine (D2) receptor antagonist. The effective dose for ICU delirium depends on the severity of the delirium; a common dose range is 2–10 mg intravenous (IV) every 6 h. Adverse side effects of this medication are extrapyramidal symptoms such as acute dystonic reactions, subacute Parkinsonism, akathisia, dose-dependent QTc prolongation, and neuroleptic malignant syndrome. Haloperidol has been used as a continuous infusion to treat severe delirium. A recent clinical trial demonstrated the potential prophylactic efficacy of haloperidol in minimizing 28-day mortality, preventing delirium, and improving delirium-related outcomes in high-risk patients. An alternative approach to haloperidol involves the use of olanzapine, risperidone, quetiapine, or ziprasidone, which are the second-generation atypical antipsychotics. These atypical antipsychotics are associated with less extrapyramidal symptoms when compared with haloperidol. A prospective, randomized control trial comparing olanzapine with haloperidol demonstrated that a dose of 5 mg olanzapine was as effective as 2.5–5 mg haloperidol three times daily for ICU delirium patients. On the other hand, Yoon et al. reported that the safety and efficacy of haloperidol and atypical antipsychotics were comparable in the treatment of delirium. Boettger et al. also reported that haloperidol, risperidone, olanzapine, and aripiprazole showed similar treatment effects but had variable associated side-effects. In contrast, PAD guidelines  do not recommend haloperidol in the treatment of delirium due to lack of evidence but instead recommend atypical antipsychotics. Use of anticholinergic drugs may contribute substantially to the development of delirium among hospitalized patients. Therefore, enhancing acetylcholine levels by cholinesterase inhibitors such as physostigmine was shown to be effective in reversing anticholinergic drug-associated delirium. However, a double-blind, placebo-controlled randomized trial on rivastigmine reported no benefit in reducing duration of delirium and showed higher rate of mortality. The authors recommended not treating delirium in critically ill patients with rivastigmine. Alpha-2 agonist medication uses have been shown to be effective in decreasing the incidence of delirium in critically ill patients. These agents cause minimal respiratory depression and help in maintaining a low heart rate. Therefore, they facilitate minimal hemodynamic fluctuations and lower energy expenditure that might result in global cerebral insult. Further, alpha-2 agonists may inhibit the release and production of neurotoxic glutamate, thereby having a neuroprotective effect. Rubino et al. reported that intravenous clonidine might reduce the severity of delirium, enhance respiratory function, and minimize duration of weaning and overall ICU stay. Similarly, dexmedetomidine is a highly selective alpha-2 agonist that facilitates cooperative sedation and analgesia, without much respiratory depression. It appears to be particularly effective in lowering the incidence and duration of delirium when compared with lorazepam (MENDS trial). The safety and efficacy of dexmedetomidine compared with midazolam trial by Riker et al. showed that the incidence of delirium in dexmedetomidine-treated patients was significantly lower when compared to a midazolam group. In the ICU, benzodiazepines appear to have a significant role in the manifestation of delirium. The use of benzodiazepines has been associated with prolonged ventilation and ICU length of stay compared to nonbenzodiazepines use, and they are known to suppress level III or IV rapid eye movement (REM) sleep. Benzodiazepine use in ICU is also associated with posttraumatic stress disorder and depression. Hence, physician must carefully assess the risk/benefit ratio of administering such medications in the ICU. Recent guidelines counsel against prolonged use of benzodiazepines However, abrupt withdrawal of benzodiazepines is also problematic, causing nightmares and a surge of REM activity. If patients have any history of alcohol abuse, benzodiazepines can be used for alcohol withdrawal; otherwise, benzodiazepines should only be used sparingly and only if it can be demonstrated that the benefit outweighs the risk. The incidence of delirium has been reportedly doubled with alcohol abuse, even in the absence of classical symptoms of alcohol withdrawal. High doses of lorazepam, diazepam, and oxazepam are considered as the standard treatment in patients with symptomatic alcohol withdrawal delirium. Use of mechanical or physical restraints impedes freedom of movement and prevents noncompliance with lifesaving treatment in critically ill patients. They are commonly used to prevent self-extubation, removal of central venous catheters, arterial catheters, drains and to provide life-supporting treatment. A large survey-based study from France showed that in one-third of the ICUs, 50% of calm, awake, and cooperative patients were restrained. In 68% of ICUs, more than 50% of the patients were restrained without written medical orders, and restraints were removed without written orders in more than 50% of the patients in 77% of the ICUs. Written order physical restraint was followed only in 21% of ICUs. The use of mechanical or physical restraints for critically ill patients in ICU remains controversial as it encompasses physical, psychological, legal, and ethical issues. A few studies have examined the capacity of individuals to provide informed consent., However, these investigators did not specifically make efforts for the assessment of delirium. Adamis et al. investigated various methods for gaining informed consent from elderly patients who had developed delirium. The authors identified that type of method used for obtaining informed consent could significantly affect the subject recruitment. Therefore, recruitment method based on case mix should be utilized to obtain an ethical balance for autonomy (informed consent) with minimal selection bias. The Mental Capacity Act (2005) states that “someone is using restraint if they use force or threaten to use force, to make someone do something that they are resisting or restrict a person's freedom of movement, whether they are resisting or not.” Moreover, before restraining a patient, a clinician must satisfy two conditions. First, the clinician should reasonably believe that it is necessary to use restraint to prevent harm to the patient. Second, the likelihood of the patient experiencing suffering and the seriousness of harm should be considered. Therefore, in case of emergency situation, there is no obligation to obtain consent for a delirious patient who can be treated under the common law doctrine of implied consent. One study revealed that 33% of patients physically restrained were more likely to be on MV, need sedation, managed in a larger unit and with a lower daytime nurse: patient ratio. Paterson et al. reported that use of physical restraints could be hazardous with potential complications such as functional and cognitive deterioration, injuries, strangulation, and death. Although delirium is a transient and reversible syndrome, its occurrence in ICU patients may be associated with long-term cognitive dysfunction. It is gaining attention as an identifiable and potentially preventable serious acute neuropsychiatric condition. For appropriate management of delirium, early identification and risk factor assessment are most important. Multidisciplinary collaboration and standardized care can enhance the recognition of delirium. To minimize risk factors and detect delirium and initiate appropriate treatment intervention, the validated delirium bedside screening tools should be implemented daily as routine practice by the ICU team. Sedation monitoring using simple instruments such as RASS should be integrated with the use of a delirium screening tool. Use of medications in the ICU is an important modifiable risk factor for delirium. Although the safety and efficacy of antipsychotic medications for delirium have not been established yet through randomized controlled trials, they continue to be routinely administered by clinicians in most ICUs; their use is endorsed by guideline recommendations. An interdisciplinary team approach together with improved guideline use is successful in minimizing sedation, duration of MV, and delirium in ICU settings. However, the current guidelines are not routinely used in clinical practice despite proven benefit behind this recommendation. Regular and routine physical therapies are effective in achieving improved functional status, reduced duration of delirium, and higher ventilator-free days. In addition, evidence-based sleep hygiene and significant noise reductions help in lowering the incidence of delirium. Moreover, use of restraint is needed to prevent harm among mechanically ventilated patients with certain ethical constraints. Restraints should only be used in situ ations where all other therapies have failed, and under consultation of the multidisciplinary team, with full ethical considerations. Further prospective studies are needed to understand the epidemiology and risk factors for delirium and to discover further preventive interventions to help reduce the incidence and improve the prognosis, for ICU patients suffering from delirium. Smith J, Seirafi J. Delirium and dementia. In: Marx JA 3rd, Hockberger RS, Walls RM, editors. Rosen's Emergency Medicine Concepts and Clinical Practices. 7th ed. Philadelphia, PA: Elsevier; 2010. p. 1367-73. Potter J, George J; Guideline Development Group. The prevention, diagnosis and management of delirium in older people: Concise guidelines. Clin Med (Lond) 2006;6:303-8. Ely EW, Gautam S, Margolin R, Francis J, May L, Speroff T, et al. The impact of delirium in the Intensive Care Unit on hospital length of stay. Intensive Care Med 2001;27:1892-900. Ely EW, Shintani A, Truman B, Speroff T, Gordon SM, Harrell FE Jr., et al. Delirium as a predictor of mortality in mechanically ventilated patients in the Intensive Care Unit. JAMA 2004;291:1753-62. Pandharipande P, Cotton BA, Shintani A, Thompson J, Pun BT, Morris JA Jr., et al. Prevalence and risk factors for development of delirium in surgical and trauma Intensive Care Unit patients. J Trauma 2008;65:34-41. Salluh JI, Soares M, Teles JM, Ceraso D, Raimondi N, Nava VS, et al. Delirium epidemiology in critical care (DECCA): An international study. Crit Care 2010;14:R210. Milbrandt EB, Deppen S, Harrison PL, Shintani AK, Speroff T, Stiles RA, et al. Costs associated with delirium in mechanically ventilated patients. Crit Care Med 2004;32:955-62. American Psychiatric Association. Diagnostic and Statistical Manual of Mental Disorders DSM-IV-TR. Chicago: American Psychiatric Association; 2000. p. 135-47. Girard TD, Jackson JC, Pandharipande PP, Pun BT, Thompson JL, Shintani AK, et al. Delirium as a predictor of long-term cognitive impairment in survivors of critical illness. Crit Care Med 2010;38:1513-20. Seneff MG, Mathews RA. Use of haloperidol infusions to control delirium in critically ill adults. Ann Pharmacother 1995;29:690-3. Ely EW, Inouye SK, Bernard GR, Gordon S, Francis J, May L, et al. Delirium in mechanically ventilated patients: Validity and reliability of the confusion assessment method for the Intensive Care Unit (CAM-ICU). JAMA 2001;286:2703-10. Ely EW, Margolin R, Francis J, May L, Truman B, Dittus R, et al. Evaluation of delirium in critically ill patients: Validation of the confusion assessment method for the Intensive Care Unit (CAM-ICU). Crit Care Med 2001;29:1370-9. Ely EW, Truman B, Shintani A, Thomason JW, Wheeler AP, Gordon S, et al. Monitoring sedation status over time in ICU patients: Reliability and validity of the Richmond Agitation-Sedation Scale (RASS). JAMA 2003;289:2983-91. Lin SM, Liu CY, Wang CH, Lin HC, Huang CD, Huang PY, et al. The impact of delirium on the survival of mechanically ventilated patients. Crit Care Med 2004;32:2254-9. Peterson JF, Pun BT, Dittus RS, Thomason JW, Jackson JC, Shintani AK, et al. Delirium and its motoric subtypes: A study of 614 critically ill patients. J Am Geriatr Soc 2006;54:479-84. Scotto CJ, McClusky C, Spillan S, Kimmel J. Earplugs improve patients' subjective experience of sleep in critical care. Nurs Crit Care 2009;14:180-4. Stransky M, Schmidt C, Ganslmeier P, Grossmann E, Haneya A, Moritz S, et al. Hypoactive delirium after cardiac surgery as an independent risk factor for prolonged mechanical ventilation. J Cardiothorac Vasc Anesth 2011;25:968-74. Pandharipande P, Cotton BA, Shintani A, Thompson J, Costabile S, Truman Pun B, et al. Motoric subtypes of delirium in mechanically ventilated surgical and trauma Intensive Care Unit patients. Intensive Care Med 2007;33:1726-31. Luetz A, Heymann A, Radtke FM, Chenitir C, Neuhaus U, Nachtigall I, et al. Different assessment tools for Intensive Care Unit delirium: Which score to use? Crit Care Med 2010;38:409-18. Mu DL, Wang DX, Li LH, Shan GJ, Li J, Yu QJ, et al. High serum cortisol level is associated with increased risk of delirium after coronary artery bypass graft surgery: A prospective cohort study. Crit Care 2010;14:R238. Plaschke K, Fichtenkamm P, Schramm C, Hauth S, Martin E, Verch M, et al. Early postoperative delirium after open-heart cardiac surgery is associated with decreased bispectral EEG and increased cortisol and interleukin-6. Intensive Care Med 2010;36:2081-9. Rubino AS, Onorati F, Caroleo S, Galato E, Nucera S, Amantea B, et al. Impact of clonidine administration on delirium and related respiratory weaning after surgical correction of acute type-A aortic dissection: Results of a pilot study. Interact Cardiovasc Thorac Surg 2010;10:58-62. Bergeron N, Dubois MJ, Dumont M, Dial S, Skrobik Y. Intensive Care Delirium Screening Checklist: Evaluation of a new screening tool. Intensive Care Med 2001;27:859-64. Skrobik YK, Bergeron N, Dumont M, Gottfried SB. Olanzapine vs. haloperidol: Treating delirium in a critical care setting. Intensive Care Med 2004;30:444-9. Immers HE, Schuurmans MJ, van de Bijl JJ. Recognition of delirium in ICU patients: A diagnostic study of the NEECHAM confusion scale in ICU patients. BMC Nurs 2005;4:7. Ely EW, Girard TD, Shintani AK, Jackson JC, Gordon SM, Thomason JW, et al. Apolipoprotein E4 polymorphism as a genetic predisposition to delirium in critically ill patients. Crit Care Med 2007;35:112-7. Pandharipande PP, Pun BT, Herr DL, Maze M, Girard TD, Miller RR, et al. Effect of sedation with dexmedetomidine vs. lorazepam on acute brain dysfunction in mechanically ventilated patients: The MENDS randomized controlled trial. JAMA 2007;298:2644-53. Plaschke K, von Haken R, Scholz M, Engelhardt R, Brobeil A, Martin E, et al. Comparison of the confusion assessment method for the Intensive Care Unit (CAM-ICU) with the Intensive Care Delirium Screening Checklist (ICDSC) for delirium in critical care patients gives high agreement rate(s). Intensive Care Med 2008;34:431-6.
van Eijk MM, van Marum RJ, Klijn IA, de Wit N, Kesecioglu J, Slooter AJ. Comparison of delirium assessment tools in a mixed Intensive Care Unit. Crit Care Med 2009;37:1881-5. Schweickert WD, Pohlman MC, Pohlman AS, Nigos C, Pawlik AJ, Esbrook CL, et al. Early physical and occupational therapy in mechanically ventilated, critically ill patients: A randomised controlled trial. Lancet 2009;373:1874-82. Riker RR, Shehabi Y, Bokesch PM, Ceraso D, Wisemandle W, Koura F, et al. Dexmedetomidine vs. midazolam for sedation of critically ill patients: A randomized trial. JAMA 2009;301:489-99. Morandi A, Gunther ML, Vasilevskis EE, Girard TD, Hopkins RO, Jackson JC, et al. Neuroimaging in delirious Intensive Care Unit patients: A preliminary case series report. Psychiatry (Edgmont) 2010;7:28-33. Benbenbishty J, Adam S, Endacott R. Physical restraint use in Intensive Care Units across Europe: The PRICE study. Intensive Crit Care Nurs 2010;26:241-5. McGrane S, Girard TD, Thompson JL, Shintani AK, Woodworth A, Ely EW, et al. Procalcitonin and C-reactive protein levels at admission as predictors of duration of acute brain dysfunction in critically ill patients. Crit Care 2011;15:R78. Grandi C, Tomasi CD, Fernandes K, Stertz L, Kapczinski F, Quevedo J, et al. Brain-derived neurotrophic factor and neuron-specific enolase, but not S100ß, levels are associated to the occurrence of delirium in Intensive Care Unit patients. J Crit Care 2011;26:133-7. Van Rompaey B, Elseviers MM, Van Drom W, Fromont V, Jorens PG. The effect of earplugs during the night on the onset of delirium and sleep perception: A randomized controlled trial in intensive care patients. Crit Care 2012;16:R73. Devlin JW, Fong JJ, Fraser GL, Riker RR. Delirium assessment in the critically ill. Intensive Care Med 2007;33:929-40. Van Eijk MM, Kesecioglu J, Slooter AJ. Intensive care delirium monitoring and standardised treatment: A complete survey of Dutch Intensive Care Units. Intensive Crit Care Nurs 2008;24:218-21. Hshieh TT, Fong TG, Marcantonio ER, Inouye SK. Cholinergic deficiency hypothesis in delirium: A synthesis of current evidence. J Gerontol A Biol Sci Med Sci 2008;63:764-72. Han L, McCusker J, Cole M, Abrahamowicz M, Primeau F, Elie M. Use of medications with anticholinergic effect predicts clinical severity of delirium symptoms in older medical inpatients. Arch Intern Med 2001;161:1099-105. Flacker JM, Cummings V, Mach JR Jr., Bettin K, Kiely DK, Wei J. The association of serum anticholinergic activity with delirium in elderly medical patients. Am J Geriatr Psychiatry 1998;6:31-41. Reynolds GP. Receptor mechanisms in the treatment of schizophrenia. J Psychopharmacol 2004;18:340-5.
van der Mast RC, Fekkes D. Serotonin and amino acids: Partners in delirium pathophysiology? Semin Clin Neuropsychiatry 2000;5:125-31. Davis KM, Wu JY. Role of glutamatergic and GABAergic systems in alcoholism. J Biomed Sci 2001;8:7-19. Ali S, Patel M, Jabeen S, Bailey RK, Patel T, Shahid M, et al. Insight into delirium. Innov Clin Neurosci 2011;8:25-34.
van Munster BC, Bisschop PH, Zwinderman AH, Korevaar JC, Endert E, Wiersinga WJ, et al. Cortisol, interleukins and S100B in delirium in the elderly. Brain Cogn 2010;74:18-23. Soiza RL, Sharma V, Ferguson K, Shenkin SD, Seymour DG, Maclullich AM. Neuroimaging studies of delirium: A systematic review. J Psychosom Res 2008;65:239-48. Van Rompaey B, Schuurmans MJ, Shortridge-Baggett LM, Truijen S, Bossaert L. Risk factors for intensive care delirium: A systematic review. Intensive Crit Care Nurs 2008;24:98-107. Hipp DM, Ely EW. Pharmacological and nonpharmacological management of delirium in critically ill patients. Neurotherapeutics 2012;9:158-75.
van Munster BC, Korevaar JC, de Rooij SE, Levi M, Zwinderman AH. The association between delirium and the apolipoprotein E epsilon4 allele in the elderly. Psychiatr Genet 2007;17:261-6. Alagiakrishnan K, Wiens CA. An approach to drug induced delirium in the elderly. Postgrad Med J 2004;80:388-93. Girard TD, Pandharipande PP, Ely EW. Delirium in the Intensive Care Unit. Crit Care 2008;12 Suppl 3:S3. Inouye SK, Bogardus ST Jr., Charpentier PA, Leo-Summers L, Acampora D, Holford TR, et al. A multicomponent intervention to prevent delirium in hospitalized older patients. N Engl J Med 1999;340:669-76. Inouye SK, Baker DI, Fugal P, Bradley EH; HELP Dissemination Project. Dissemination of the hospital elder life program: Implementation, adaptation, and successes. J Am Geriatr Soc 2006;54:1492-9. NICE Clinical Guidelines CG103. Delirium: Diagnosis, Prevention and Management; 2010. Available from: https://www.nice.org.uk/guidance/cg103rete. [Last accessed on 2015 May 25]. Jacobi J, Fraser GL, Coursin DB, Riker RR, Fontaine D, Wittbrodt ET, et al. Clinical practice guidelines for the sustained use of sedatives and analgesics in the critically ill adult. Crit Care Med 2002;30:119-41. King MS, Render ML, Ely EW, Watson PL. Liberation and animation: Strategies to minimize brain dysfunction in critically ill patients. Semin Respir Crit Care Med 2010;31:87-96. Vasilevskis EE, Ely EW, Speroff T, Pun BT, Boehm L, Dittus RS. Reducing iatrogenic risks: ICU-acquired delirium and weakness – Crossing the quality chasm. Chest 2010;138:1224-33. Morandi A, Brummel NE, Ely EW. Sedation, delirium and mechanical ventilation: The 'ABCDE' approach. Curr Opin Crit Care 2011;17:43-9. Riker RR, Picard JT, Fraser GL. Prospective evaluation of the sedation-agitation scale for adult critically ill patients. Crit Care Med 1999;27:1325-9. Sessler CN, Gosnell MS, Grap MJ, Brophy GM, O'Neal PV, Keane KA, et al. The Richmond Agitation-Sedation Scale: Validity and reliability in adult Intensive Care Unit patients. Am J Respir Crit Care Med 2002;166:1338-44. Barr J, Pandharipande PP. The pain, agitation, and delirium care bundle: Synergistic benefits of implementing the 2013 pain, agitation, and delirium guidelines in an integrated and interdisciplinary fashion. Crit Care Med 2013;41 9 Suppl 1:S99-115. DAS-Taskforce, Baron R, Binder A, Biniek R, Braune S, Buerkle H, et al. Evidence and consensus based guideline for the management of delirium, analgesia, and sedation in intensive care medicine. Revision 2015 (DAS-Guideline 2015) – Short version. Ger Med Sci 2015;13:Doc19. doi: 10.3205/000223. eCollection 2015. Chlan L. Effectiveness of a music therapy intervention on relaxation and anxiety for patients receiving ventilatory assistance. Heart Lung 1998;27:169-76. Dijkstra BM, Gamel C, van der Bijl JJ, Bots ML, Kesecioglu J. The effects of music on physiological responses and sedation scores in sedated, mechanically ventilated patients. J Clin Nurs 2010;19:1030-9. Seitz DP, Gill SS, van Zyl LT. Antipsychotics in the treatment of delirium: A systematic review. J Clin Psychiatry 2007;68:11-21. Ely EW, Stephens RK, Jackson JC, Thomason JW, Truman B, Gordon S, et al. Current opinions regarding the importance, diagnosis, and management of delirium in the Intensive Care Unit: A survey of 912 healthcare professionals. Crit Care Med 2004;32:106-12. Patel RP, Gambrell M, Speroff T, Scott TA, Pun BT, Okahashi J, et al. Delirium and sedation in the Intensive Care Unit: Survey of behaviors and attitudes of 1384 healthcare professionals. Crit Care Med 2009;37:825-32. Wolkin A, Brodie JD, Barouche F, Rotrosen J, Wolf AP, Smith M, et al. Dopamine receptor occupancy and plasma haloperidol levels. Arch Gen Psychiatry 1989;46:482-4. Riker RR, Fraser GL, Richen P. Movement disorders associated with withdrawal from high-dose intravenous haloperidol therapy in delirious ICU patients. Chest 1997;111:1778-81.
van den Boogaard M, Slooter AJ, Brüggemann RJ, Schoonhoven L, Kuiper MA, van der Voort PH, et al. 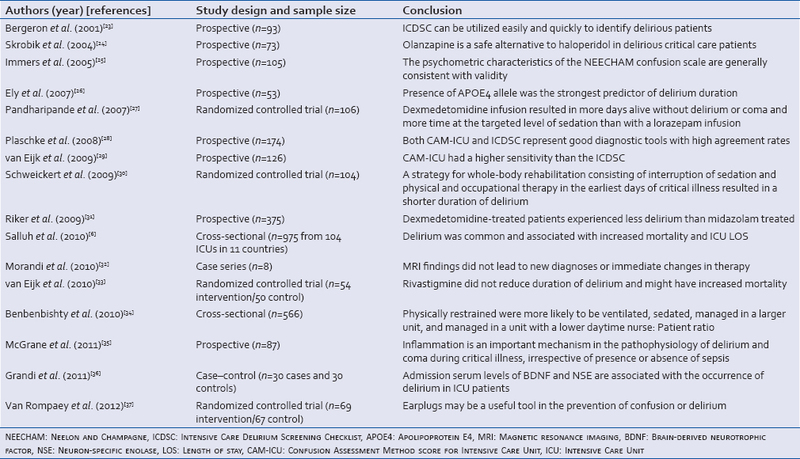 Prevention of ICU delirium and delirium-related outcome with haloperidol: A study protocol for a multicenter randomized controlled trial. Trials 2013;14:400. Yoon HJ, Park KM, Choi WJ, Choi SH, Park JY, Kim JJ, et al. Efficacy and safety of haloperidol versus atypical antipsychotic medications in the treatment of delirium. BMC Psychiatry 2013;13:240. Boettger S, Jenewein J, Breitbart W. Haloperidol, risperidone, olanzapine and aripiprazole in the management of delirium: A comparison of efficacy, safety, and side effects. Palliat Support Care 2015;13:1079-85. Fong TG, Tulebaev SR, Inouye SK. Delirium in elderly adults: Diagnosis, prevention and treatment. Nat Rev Neurol 2009;5:210-20. Aantaa R, Jalonen J. Perioperative use of alpha2-adrenoceptor agonists and the cardiac patient. Eur J Anaesthesiol 2006;23:361-72. Huang R, Chen Y, Yu AC, Hertz L. Dexmedetomidine-induced stimulation of glutamine oxidation in astrocytes: A possible mechanism for its neuroprotective activity. J Cereb Blood Flow Metab 2000;20:895-8. Fraser GL, Devlin JW, Worby CP, Alhazzani W, Barr J, Dasta JF, et al. Benzodiazepine versus nonbenzodiazepine-based sedation for mechanically ventilated, critically ill adults: A systematic review and meta-analysis of randomized trials. Crit Care Med 2013;41 9 Suppl 1:S30-8. Weinhouse GL, Watson PL. Sedation and sleep disturbances in the ICU. Crit Care Clin 2009;25:539-49, ix. Wade DM, Howell DC, Weinman JA, Hardy RJ, Mythen MG, Brewin CR, et al. Investigating risk factors for psychological morbidity three months after intensive care: A prospective cohort study. Crit Care 2012;16:R192. Blondell RD, Powell GE, Dodds HN, Looney SW, Lukan JK. Admission characteristics of trauma patients in whom delirium develops. Am J Surg 2004;187:332-7. Mainerova B, Prasko J, Latalova K, Axmann K, Cerna M, Horacek R, et al. Alcohol withdrawal delirium – Diagnosis, course and treatment. Biomed Pap Med Fac Univ Palacky Olomouc Czech Repub 2015;159:44-52. De Jonghe B, Constantin JM, Chanques G, Capdevila X, Lefrant JY, Outin H, et al. Physical restraint in mechanically ventilated ICU patients: A survey of French practice. Intensive Care Med 2013;39:31-7. Chang LY, Wang KW, Chao YF. Influence of physical restraint on unplanned extubation of adult intensive care patients: A case-control study. Am J Crit Care 2008;17:408-15. Bray K, Hill K, Robson W, Leaver G, Walker N, O'Leary M, et al. British Association of Critical Care Nurses position statement on the use of restraint in adult critical care units. Nurs Crit Care 2004;9:199-212. Martin B, Mathisen L. Use of physical restraints in adult critical care: A bicultural study. Am J Crit Care 2005;14:133-42. Hine K. The use of physical restraint in critical care. Nurs Crit Care 2007;12:6-11. Auerswald KB, Charpentier PA, Inouye SK. The informed consent process in older patients who developed delirium: A clinical epidemiologic study. Am J Med 1997;103:410-8. Adamis D, Martin FC, Treloar A, Macdonald AJ. Capacity, consent, and selection bias in a study of delirium. J Med Ethics 2005;31:137-43. Mental Capacity Act; 2005. Available from: http://www.legislation.gov.uk/ukpga/2005/9/pdfs/ukpga_20050009_en.pdf. [Last accessed on 2015 Jun 08]. Fogel BS, Mills MJ, Landen JE. Legal aspects of the treatment of delirium. Hosp Community Psychiatry 1986;37:154-8. Fraser GL, Prato BS, Riker RR, Berthiaume D, Wilkins ML. Frequency, severity, and treatment of agitation in young versus elderly patients in the ICU. Pharmacotherapy 2000;20:75-82. Maccioli GA, Dorman T, Brown BR, Mazuski JE, McLean BA, Kuszaj JM, et al. Clinical practice guidelines for the maintenance of patient physical safety in the Intensive Care Unit: Use of restraining therapies – American College of Critical Care Medicine Task Force 2001-2002. Crit Care Med 2003;31:2665-76. Carrión MI, Ayuso D, Marcos M, Paz Robles M, de la Cal MA, Alía I, et al. Accidental removal of endotracheal and nasogastric tubes and intravascular catheters. Crit Care Med 2000;28:63-6. Reigle J. The ethics of physical restraints in critical care. AACN Clin Issues 1996;7:585-91. Paterson B, Bradley P, Stark C, Saddler D, Leadbetter D, Allen D. Deaths associated with restraint use in health and social care in the UK. The results of a preliminary survey. J Psychiatr Ment Health Nurs 2003;10:3-15.